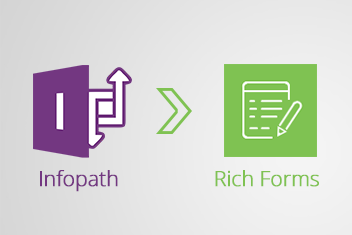 How to migrate from InfoPath to skybow Rich Forms. 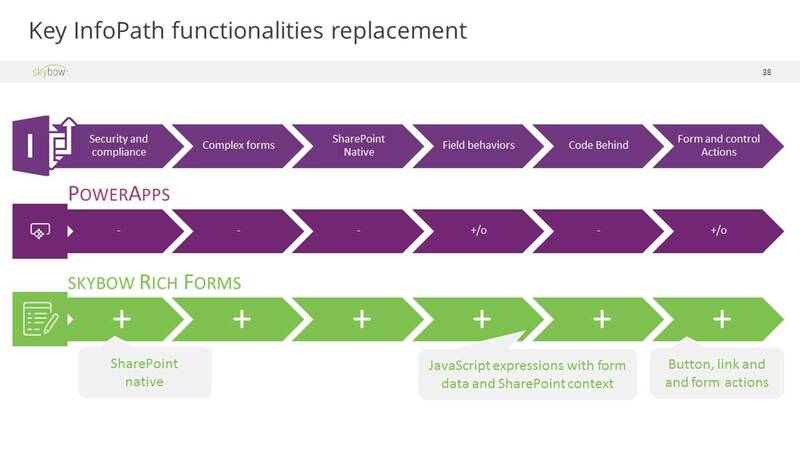 Thanks everyone who has joined our Webinar about replacing InfoPath with skybow Rich Forms on 20.10.2016. skybow Rich Forms is arguably the only product on the market which can cover InfoPath features with SharePoint one to one. In addition to that, skybow Rich Forms are built on modern client-side technology, light weight and offer easy deployment and migration. Nicklas from Sweden has asked what about connecting to external datasources? skybow Rich Forms can be used for List Forms and Pages, and use SharePoint lists and libraries as the data source. External lists, which consume external data through BCS, can be used as the data source for skybow Rich Forms. Marco from Switzerland has asked if it is possible to apply the rich form themes also for the skybow apps? skybow Theme Designer, which is used for theming and designing skybow Rich Forms, can be used for designing all the other apps and site elements. Even more, it should be used on that way, to create styles which will be applied to multiple elements, pages or even sites. The special skybow Theme Designer webinar is announced for the 9th of November. You can register right now!